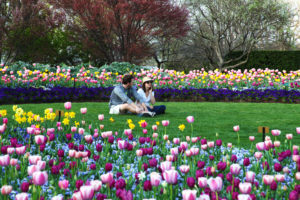 Dallas Blooms’ “Life’s a Picnic” runs from Feb. 23 to April 7 at the Dallas Arboretum and Botanical Garden. With the greatest views of the downtown Dallas skyline and White Rock Lake, the Dallas Arboretum is hailed as one of the best picnic spots in North Texas, so Dallas Blooms celebrates with the theme, “Life’s a Picnic.” Presented by IBERIABANK, the festival runs from Feb. 23 to April 7 and features an extraordinary, larger-than-life, picnic scene topiary comprised of a stunning 40’x40′ picnic blanket, a vase of flowers, a picnic basket with pie and a giant picnic ant, sponsored by Dave Perry-Miller Real Estate. Flowers are another highlight of the festival with more than 100 varieties of spring bulbs and 500,000 blooms bursting with color. Every weekend, there’s live music on the Martin Rutchik Concert Stage and Lawn — the perfect place to picnic and listen to the sounds of the best of the best party bands during Dallas Blooms. Each week also showcases one of the best picnic scenes throughout film. Special events, A Tasteful Place cooking demonstrations and tastings, and the reopening of the Rory Meyers Children’s Adventure Garden add to the festivities of this favorite springtime festival.